Leonie Gibbs, Paul Vanstone and Carol Peace are all sculptors who work within a strong figurative tradition on both a domestic and monumental scale. In different ways their work draws strength and inspiration from the land in turn merging sympathetically into a rural or domestic landscape. Leonie Gibbs has lived most of her life in Scotland. The Scottish landscape and its myths and legends as well as her love of wild animals have been the most formative influences on her work. She is also fascinated by Greek and Egyptian myths. 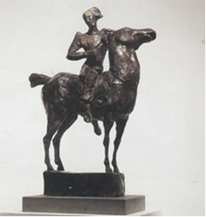 Working in bronze her pieces are dynamic and posed for action inhabiting an imaginative world of story telling and heroism played out against the wild Scottish landscape. 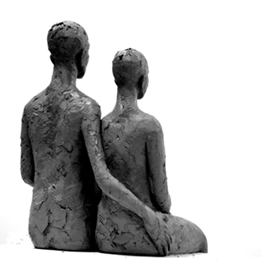 By contrast, Carol Peace’s figures inhabit an inner world of self-reflection. She derives her knowledge of the human body from detailed life drawings but when she models them in clay the figures come from her imagination reaching beyond mere depiction. With their delicately balanced forms and rock like plinths the large-scale works relate to forms and volumes found in the landscape, their often elongated limbs and strange proportions lending them a surreal air. They invite the viewer to mediate on the human condition, the step from adolescence to adult hood or the vulnerability of a mother and child. 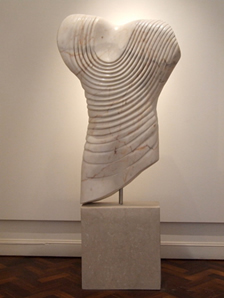 Paul Vanstone is fascinated by the material properties of his medium. Recently he has abandoned modelling to work directly as a carver. Hunting down the right materials whether from Spain, Italy or Portugal is part of his creative process. The physical properties of the stone are part of the language of the finished piece. 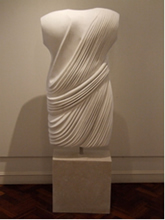 His most recent work is executed in Thassos marble associated with the purity of ancient Greek sculpture. In these drapery studies he is playing with formal qualities, pattern across a volume, the contrast between the hardness and coldness of the medium and the warm soft cloth. The finished works have a drawn quality, a sense of line crossing volume, a delicate flow and balance. Yet they still retain the rawness and power of the original block of marble quarried from earth. 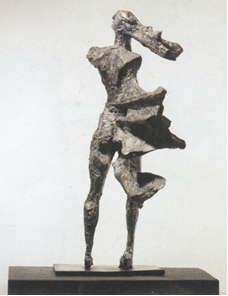 The sculpture will be shown with Oona Campbell’s Sussex landscapes inside the gallery as well as in the open air. Arts writer Elspeth Moncrieff set up the Moncrieff-Bray Gallery in 2005. The gallery holds regular exhibitions of contemporary art and sculpture in a spectacular oak framed barn and surrounding garden and landscape. It is located on the A283 between Petworth and Pulborough approximately an hour and a quarter from central London.